Exclusive! 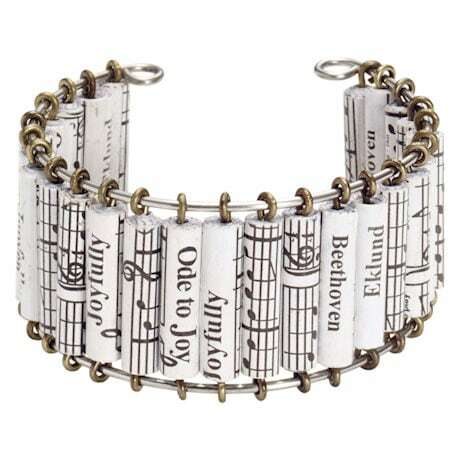 For the music lover. Each bead is hand-rolled from paper printed with Beethoven's "Ode to Joy" and sealed with glossy waterproof lacquer. Bracelet (HX6117) is 1&frac18;" wide, about 2½" diameter (standard size) and slightly adjustable. Coordinating earrings (HX6157-sold separately) hang 2½". Lead- and nickel-free. Imported.